Elite Agent Magazine is a one-of-a-kind independent publication for real estate industry professionals covering Leadership, Sales and Property Management. This publication is a leading source of industry news and information for those who want to 'Learn from the Best'. 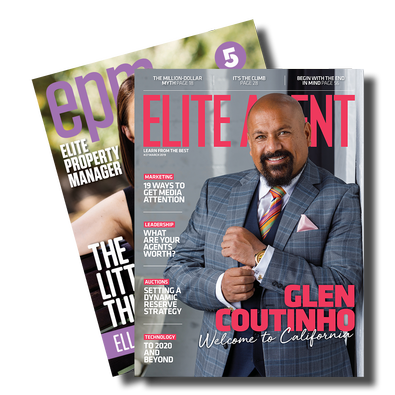 Elite Agent and Elite Property Manager is now combined into one magazine with 2 beautiful covers in a new format, double sided magazine delivered direct to your doorstep. Be the first person to tell us what you think about Elite Agent (AU) and you'll save $5 on your next purchase!